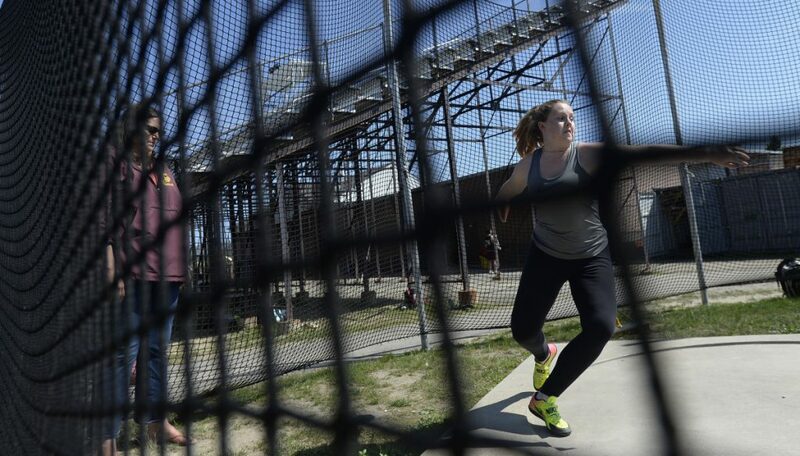 SACO — Lisa Huntress started competing in throwing events 33 years ago at York High, then went on to coach her events as an undergraduate at the University of New Hampshire. Now the girls’ track and field coach at Thornton Academy, she is immersed in the art of throwing. Her expertise could pay dividends Saturday at the Class A state championships, where Thornton will be among the favorites for both boys’ and girls’ titles. At the SMAA championships last weekend, the Trojans amassed 48 of their 94 points in the last four events – the discus, triple jump, pole vault and 1,600-meter relay – to win their fifth straight conference title. The Thornton girls go into the state meet at McMann Field in Bath as one of the team’s to beat, with defending champion Cheverus and Scarborough, which shared the indoor title with Cheverus this winter. On the boys’ side, Thornton again brings a cadre of talented field-event specialists, but will be challenged by defending champion Scarborough as well as Falmouth. In Class B, the girls’ competition at Foxcroft Academy will be among Greely, York, Belfast and Brewer. On the boys’ side, York will seek its third title in seven years while trying to hold off Hermon as well as Brewer, which finished fifth in Class A last year. At the Class C meet at Massabesic High in Waterboro, the Orono girls will go for their seventh straight title. The boys’ meet should come down to Wells, Orono and Mattanawcook Academy, which is led by All-American triple jumper Cayden Spencer-Thompson. The Thornton girls should total a bunch of points in the discus, pole vault, long jump and 400-meter relay, which they won last year. They have the top two discus throwers in the state in sophomore Jaigan Boudreau (125 feet, 9 inches) and junior Johnna Scott (111-3), the top-ranked long jumper in sophomore Mia Taranko (18-3), and one of the three top pole vaulters in the state in junior Katie-Marie Roy (10-0). Then again, the field events have been a Thornton tradition. Every time the talent pool seems to run dry, it’s somehow replenished. Take Boudreau, who finished 29th at the state meet in the javelin last year. The spunky sophomore who plays field hockey and ice hockey picked up the discus this spring and quickly improved from 70 feet to 90 feet to 100 feet, to 125-9 at the SMAA championships. Aided by her coaches, Boudreau overhauled her shoulder position, steps, grip and release. Boudreau also credits teammates, including Scott and the No. 1 boys’ shot putter in the state, Jason Montano. “The first time I threw (the discus), my grip wasn’t right, the disc was wobbly, and Coach showed me the right grip,” Boudreau said. Thornton also has a tradition in the jumps, coached by former University of Maine jumper Carl Smith, who has won four outdoor state titles with Huntress. “We have some work to do but if everyone does what they can, yes,” Smith said of the team’s title chances.